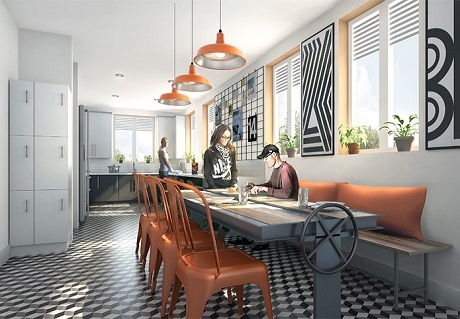 DWPF acted as financial advisor to Campus Living Villages (CLV) and Arlington Investors on their 50-year student accommodation PPP project with Goldsmiths, University of London. The transaction is the latest joint-venture between CLV and Arlington, following on from the c£245m acquisition of assets from Opal in May 2013 which DWPF also advised on. CLV will undertake the daily management and future refurbishment of three sites – Raymont Hall, Chesterman House and Surrey House – to establish the Goldsmiths Student Village. The village will have a total of 391 beds, ranging from shared flats to en-suite single rooms. This will create a more rewarding living and study environment for Goldsmith’s students. Indoor communal spaces will have a homely ethos, combining relaxation and learning zones, furnished with sofa seating, gaming consoles, tablets and smart TVs. Outdoor areas will be refreshed with a calming, clean appearance and informal style. Other features will include new or refurbished main entrances and reception areas and CLV is maximising security.